Despite media misinformation and EU blackmail, anti-austerity forces in Greece remain strong ahead of Sunday's referendum. My “uncharacteristic silence” of the last few days, as someone described it on my Facebook page, is simply due to the fact that, since I arrived in Athens for the No campaign on Sunday, I have slept very little and worked a lot. Today I spoke at two gatherings at workplaces (the central railway station in Athens and the central building of the subway). A great experience. My schedule for tomorrow includes talks at various gatherings in the industrial zone of Moschato and a public meeting in Petroupoli, in the western suburbs of Athens. Workers feel the pressure of the situation created by the media hysteria and the closure of the banks. They are rather critical of the concessions made by the government during those exhausting “negotiations,” but in general they are confident in the victory of No. They expect this to be a new start for the Syriza government, with more of its program implemented. I would urge all those who follow what is going on in Greece with the typical mixture of anxiety and hope to keep as cool a head as possible. 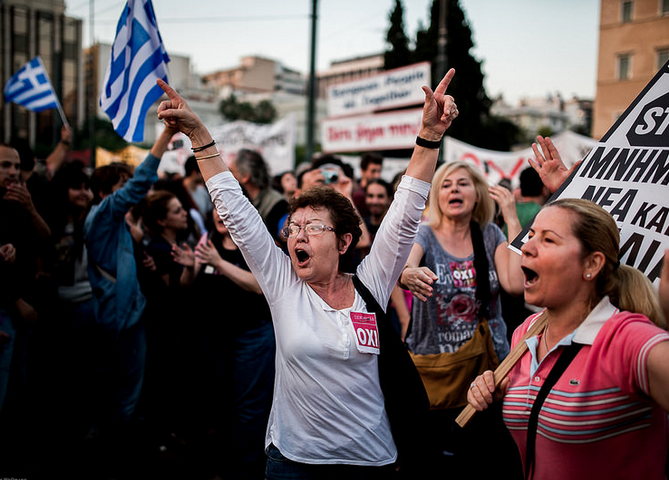 The Greek media are in a hysterical state, and the Western media are not that different. One of their favorite themes, on top of the apocalyptic atmosphere they are propagating, is that the referendum will not take place, that the government has actually accepted the Juncker plan and will cancel the referendum and so on. Beware of such misinformation. It is true that some initiatives of the government are, to say the least, ambiguous and debatable. This is particularly true of yesterday’s proposal for a new loan from the European Stability Mechanism and Prime Minister Alexis Tsipras’s letter to the Eurogroup disclosed today. Their aim is to display goodwill and give credit to the position that what will take place next week, following a potential victory of No, is a new cycle of “negotiations.” But everyone knows that a) this is very unlikely to happen and b) that in any case there aren’t any proper negotiations going on now: Merkel made it clear that absolutely no talks are conceivable before Sunday. So there is a dimension of posturing on both sides and of tactical maneuvering on the side of Syriza, but it is also true that this is a reflection of contradictions within the government and Syriza. Its “realist” wing (lead by Deputy Prime Minister Yannis Dragasakis) is trying to put forward the idea that the referendum is just an unpleasant (and brief) conflictual parenthesis and that the negotiations will start anew on the basis of the very serious concessions the government had accepted just before the break of the talks. The official position, however, is that the negotiations will start from a “zero basis,” which means that all the previous Greek proposals have to now be considered obsolete. Tsipras’s speech today was well-received and widely seen as defiant, thus succeeding in overcoming the demobilizing impact of the latest proposals. But of course, the best ally of the No camp is the uncompromising and hubristic attitude of the lenders, leaving no room for “compromise,” even of the worst kind. According to opinion polls published today, “no” is ahead by eleven to thirteen points, but the gap has narrowed significantly since Monday due to the closure of banks, the restrictions on cash withdrawals, and the problem pensioners have had receiving their payments. This has inevitably created an atmosphere of uncertainty and fear, and that was exactly what the Eurogroup leaders had in mind when they decided to stop any liquidity provision. However, it is also unsurprising that it is only among pensioners and housewives that “yes” leads or is close to majority support. Everywhere else, including among small-business owners, “no” leads. A lot will depend on the capacity of each camp to mobilize, but particularly the No side. Tuesday’s gathering of Yes voters was big and well-planned, but almost exclusively upper middle-class, and that was probably the peak of what they can do in terms of mobilization. Taking into account that it was highly improvised, Monday’s No rally was a successful start. The campaign on the ground started today, and it will be almost entirely monopolized by the No camp. The mood in Greek society is one of increasing polarization — along clear class lines in the urban centers, more diffused in the countryside and in the small cities. Qualitatively speaking Syriza’s branches are galvanized, and there is an excellent relation with the comrades of Antarsya. Other forces, from the social movements and various campaigns, are also joining. A “united front” type of campaign is taking form, which is excellent news. But the big setback here is the attitude of the Communist Party, which can only be qualified as a “betrayal.” (In general I don’t like this term but in this case it seems justified.) They will present their own ballot paper, affirming a “double no” (to the troïka plan and to the government, both seen as “two sides of the same coin”), a ballot paper that of course will be invalid. Presumably they will do their own counting and then announce the result as some kind of “success” of their line. If No wins — which seems likely but not certain — and if it wins a clear majority, which also remains to be seen, it’s almost inevitable that the confrontation with the European Union and the domestic dominant class will escalate. Greece has already refused to pay the International Monetary Fund in June, and formal default will be declared in thirty days. The liquidity and currency weapons will be used even more heavily, with the European Central Bank and the European Financial Stability Facility asking for their loans to be repaid immediately. The moment of “great decisions” for Syriza will then inevitably come. A victory for the No camp would galvanize popular forces. But this outcome should not under any circumstances be considered a given. It is the object of the amazing battle that is taking place now. Despite media misinformation and EU blackmail, anti-austerity forces in Greece remain strong ahead of Sunday’s referendum.